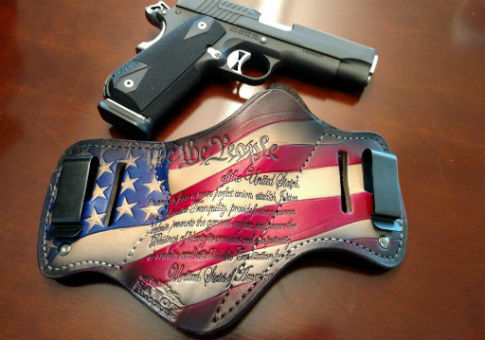 This is, easily, the most beautiful holster I’ve ever seen. It’s the most beautiful holster you can buy. And if there’s anything more American than cramming a 1911 into a holster made in America from American rawhide with a full-color American flag and the preamble to America’s Constitution carved into the side of it, I’ve yet to experience it. And I’ve experienced quite a lot of American things. The holster, made by Savoy Leather, is a handcrafted custom leather-on-leather affair that can be worn inside the waistband of your pants. Or outside the waistband. Whatever you want: American freedom, you choose. Anyway it’s specifically formed to fit my Sig Sauer. Despite clearly being designed to stand out, the holster conceals well. In fact, it conceals a bit better than my current setup since it uses metal clips that lie flat against my belt—I’ve long used leather loops that snap around my belt and create a bit of a bulge. I’m definitely switching to metal clips. As far as leather on leather holsters go, Savoy is the top of the line. They craft each holster to fit each gun they offer a holster for and they offer one for dozens of guns. The leather is thick. The engravings and coloring don’t wear off easily. Their designs feature everything from butterflies to bombs to Mario’s old nemesis Bullet Bill. I mean, just look at these things. These holsters are works of art. And that’s not to mention the fact that they can do a custom engraving of pretty much any design you want. Perhaps, if our lovely readers lobby hard enough, a special Free Beacon model could pop up in the new Washington Free Beacon store at some point. I wore the Savoy holster for an entire week so I would and have, quite literally, bet my life on it. That being said, I don’t think it will replace my current everyday carry holster. Unlike my Alien Gear kydex on leather holster, the Savoy is not modular or adjustable. I can’t adjust the cant and ride height of the gun. I can’t change the clips. I can’t swap out the shell to fit a new gun if I ever do decide change my carry gun. Most of these things aren’t major issues. I like the way the Savoy holster sits on my hip. Honestly, the biggest difference between the Savoy holster and my Alien Gear is the retention force. Though the fit on the Savoy holster will likely loosen a bit over time as it breaks in, it’s still a bit too tight for my taste. The adjustability of the Alien Gear holster still wins me over. Besides, the Savoy holster needs to be shown off. It’s practically begging to be shown off. It’s something to take to the range or shooting competition and wear openly (I certainly plan to). It’s not right to hide it under a shirt. In the end, I simply prefer the feel of a kydex on leather hybrid. Those who prefer a leather-on-leather holster should absolutely put Savoy at the top of their list. The holster I tested runs about $180, pretty reasonable considering what you get. This entry was posted in Culture and tagged 2nd Amendment, Guns, Life & Leisure. Bookmark the permalink.